By-Me is run by Katie - a passionate designer/maker who loves tying knots! Katie runs her business creating macrame plant hangers/wall hangings and bespoke projects (one being a giant dreamcatcher) from her home in South East London. Katie has a degree in Textile Design and worked for many years as a visual merchandiser for several high street interior and fashion brands. She decided after having a family, to fulfil her dream of running her own business and go back to her textile roots. Katie's workshops are fun and relaxed (and always involve cake!) a great place to meet interesting people and leave the class with a lovely finished piece for you or to give as a unique gift. If you have any questions, please contact her using the 'contact host' button on the website page." Katie is a wonderful, patient teacher & her dedication to each student means that even total beginners (i.e. me!) get to go home with a beautiful finished product. I also loved the huge choice of colours and the fact there was plenty to go around so everyone could end up with something they loved. This is an excellent and fun workshop. 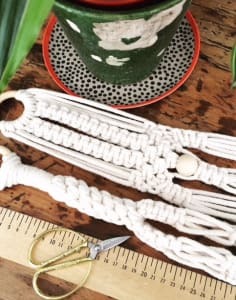 Kate is a brilliant teacher and I had the best time learning how to make my macrame plant hanger. I would really recommend this workshop. Fantastic workshop. People can't believe I actually made the finished product! Thank you. It was fantastic! I can't recommend it enough, even if your new to crafting you can take to it so easily and come out with something beautiful and useful. I enjoyed it so much I've gone and bought all the materials to try and recreate it at home.